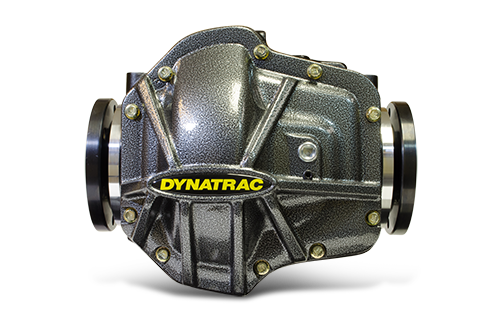 The Dynatrac ProRock XD60-IFS/IRS™ provides class-leading ground clearance, durability and strength-to-weight ratio. Ideal for purpose-built vehicles, it is a cost-effective axle solution that can be used in applications ranging from UTVs to armored high-mobility tactical vehicles. The ProRock XD60-IFS/IRS is a compact axle, measuring just 13.50 inches (343 mm) from axleshaft flange-to-flange. This allows for longer half-shafts for greater vehicle mobility. The patented Dynatrac ProRock® design provides unbeatable ground clearance and reduces the frontal impact area by 30-precent. The smooth bottom of the ProRock XD60-IFS/IRS is engineered to take direct impacts from rocks without the need of a skidplate under the axle. This reduces overall vehicle weight and cost, while providing even more ground clearance. Click here to download the datasheet on the Dynatrac Defense ProRock XD60-IFS/IRS.